Research is an excellent way to understand more about users’ interactions with a product. While research can be highly formalized or guerrilla-style, following some core principles will help you get the information you need on any project. In my previous career I was a librarian, which means I spent most of my time helping people plan and do research with secondary sources. Now in UX, I apply the same approach to planning and conducting primary research directly with users. This article gives you five principles you can use to structure and conduct any research project, regardless of how formal or quick-and-dirty it is. Don’t just do research, do research into something. This might sound obvious, but before you start, you need to be clear on the research question(s) you want to answer. A research question is the unanswered question that’s driving you to do research in the first place. It’s not the questions you ask research participants on a survey or in an interview, though those should all help you gather information that answers the larger research question. Depending on what stage of your project you’re in, your research question might be really general or very specific. So how do you write a strong research question? Good question. Research typically seeks to understand a problem, either something people struggle with in life or a difficulty they experience when using your product. So start by defining the problem you want to explore. Then ask questions about the problem — maybe why it exists, how users feel about it, or how widespread it is. Any of these might be good research questions to guide your project. Once you figure out what questions you want to explore, you can think about how you’ll find your answers. It’s important to choose a research method that will get the right kind of data to answer your research question. Using the wrong research method is like bringing cotton candy to a gun fight, which sounds delicious but unwise. A great starting point is deciding whether you need qualitative or quantitative data. Qualitative methods, like research and observation, are great for exploratory research early on, when you want to understand the basic problem. They’re open-ended and help you gather a wide range of information, so they tend to be great for answering questions like why the problem exists or what it looks like. Quantitative methods, like surveys and analytics, are close-ended and specific. They’re really good for answering questions of scale, like how common a problem is or how large its effects are. Another thing to think about is whether you’re trying to understand users’ behavior or their attitudes and preferences. If you’ve ever watched a cop show and thought “I have no idea where I was on the night of April 9!” you know that self-reporting your behavior is tricky. As a general rule, it’s better to observe behavior and ask about preferences. 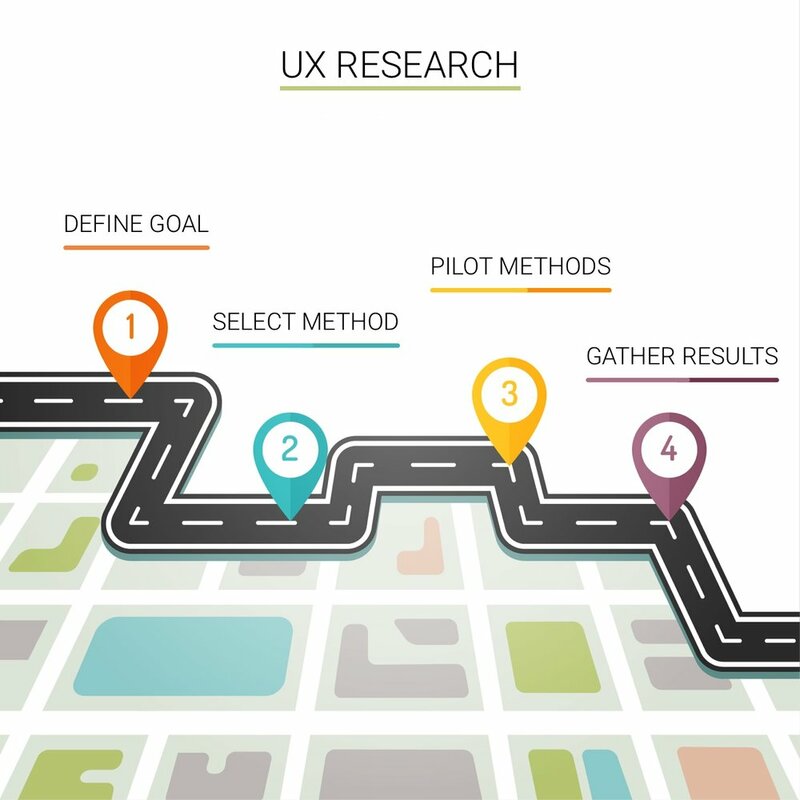 For more on choosing the most appropriate research methods, check out Raven Veal’s really awesome guide on how to conduct user experience research like a professional. Once you’ve chosen a method, you need to create your research documents that’ll guide you and your participants through the research activities. Research activities should be as brief and as focused as possible while still gathering the information you need. The content of your script, survey, or instructions should all lead back to your research question. If you find yourself asking about unrelated things, you might want to move these questions to a separate list of things to explore in future research. To make sure your documents are setting you up for success, pilot your methods with a few preliminary people prior to your official research. Run a couple interviews to see if your questions make sense. Send out your survey to a small sample to make sure people don’t give up before they finish. Run a sample usability test to make sure there’s no confusion about the instructions. However you do it, these early trials will help you validate that your research procedure does what it’s supposed to do, which is crucial for trusting your results. If you’ve ever read an academic research paper, you’ve likely noticed that there’s always a Results section, followed by a Discussion section. This is one idea that’s really easy to overlook, but it’s so important to understanding your research findings. Just as it’s essential to keep bias out of the research procedure, it’s crucial to keep bias out of research reporting. Your initial research report should present users’ behaviors, comments, and concerns as objectively as possible. Not only will this help you avoid bias in your conclusions, but it’ll invite other people on your team (or you in the future) to notice different things and draw new conclusions. Audio or video recording your research sessions (with consent, of course) is a great way to capture this data for later review. Once you’ve organized your results, it’s time to interpret them. You’ve probably seen UX-themed pictures of people standing in front of a colorful wall of Post-Its looking overly pensive. The pensive looks are usually followed by grouping related findings into categories to create an affinity map. It’s a great way to make connections between user responses or observed behavior. You might also use spreadsheets, charts, or visualizations to identify patterns in your data. This step of organizing and interpreting your research is an important bridge between your raw research data and the steps you take afterwards. Now that you’ve gathered your main insights, update your understanding of the original problem that prompted your research question. Artifacts like user personas, user stories, and journey maps can help you capture your users’ challenges, while task flows, paper sketches, and wireframes are a great way to design solutions. If you already have these artifacts, update them to reflect your latest findings. As important as stating what you know is stating what you still need to learn. Can you confidently answer your original research question? Did your research raise any new questions? Whether you’re ready to tackle the next research question immediately or you need to table it for the future, identifying what’s left to explore is an important part of wrapping up any research project.